Last night at a Donald Trump rally in San Jose, Trump supporters were attacked by an angry mob as they left the venue. Hot Air posted an article today about the violence and about the Mayor of San Jose’s comments on the riot. I hate to be difficult, but the behavior of the Donald Trump campaign was not the problem. Protesters jumped on cars, pelted Trump supporters with eggs and water balloons, snatched signs, and stole “Make America Great” hats off supporters’ heads before burning them and snapping selfies with the charred remains. Several people were caught on camera punching Trump supporters. No, California is not Mexico. The fact that the Trump protesters are claiming that it is might be food for thought. The Weekly Standard also posted an article about the protests today. I would love to know how many people were arrested and charged with assault (as they should have been). I would also like to know when it became acceptable to physically attack people who support ideas that are different than your ideas. The violence at San Jose is unacceptable. It needs to be condemned. It also needs to be understood that the people who are to blame for the violence are the people who are committing the violent acts. I don’t care who said what–there is no excuse for the behavior shown. I would also like to know how many of the protesters were paid and what the conditions of the employment were–were they encouraged to be violent? I encountered paid protesters during a political campaign in Massachusetts a number of years ago. It was very clear that they were attempting to create an incident that would get major press coverage. They were unsuccessful because no one cooperated. 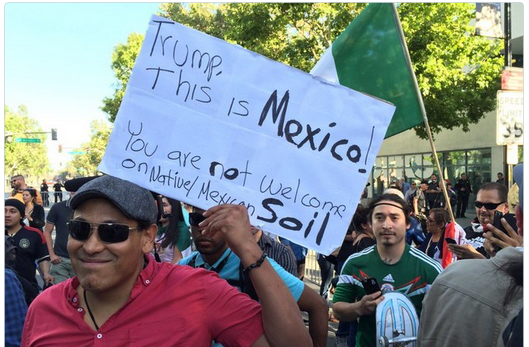 In the case of San Jose, it didn’t seem to matter what the response was, the protesters were going to be violent. Until responsibility for the violence is put on those committing the violence, we will see more of this. The solution to this is to charge anyone engaging in violent activity with assault and fine them heavily. Even though the people funding this may have deep pockets, at some point paying fines will get old. This entry was posted in Uncategorized and tagged Associated Press, Bernie Sanders, Donald Trump, Hillary Clinton, Political campaign, The Washington Post by granny g. Bookmark the permalink.